And you thought Stories were just for influencers or your oversharing cousin! If you have a good handle on creating Facebook and Instagram content at your organization, consider adding Instagram Stories to your mix. With the addition of ad placements last spring, you can lead users to your website with a simple swipe up, and without leaving the app. Before you throw your hands up and say, “We couldn’t possibly take this on,” or “Are you really asking me to make more content?” have no fear. Our In Focus series will help you get started thoughtfully and show you some case studies in action. We’re kicking things off with a summer-long, waterfront journey with ICA/Boston that’s so immersive, you’ll be able to feel the summer breeze. Founded as a sister institution to New York’s Museum of Modern Art, The Institute of Contemporary Art/Boston (ICA/Boston) features exhibitions and performances on a breathtaking waterfront setting. We’ve been working with ICA/Boston for three and a half years on their digital strategy. 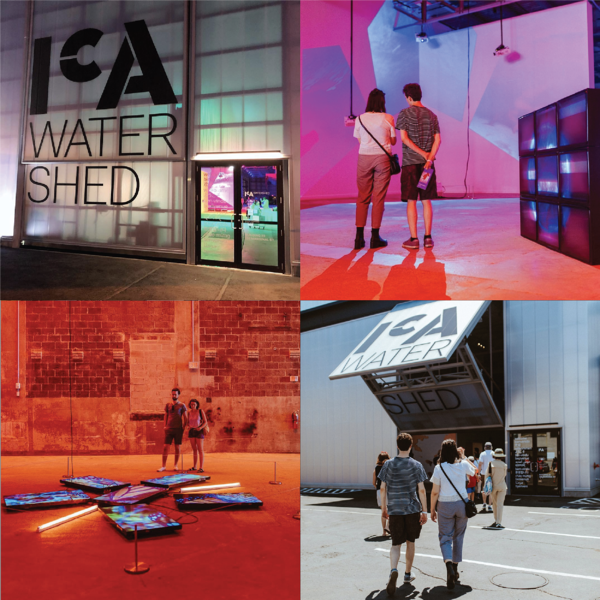 Last year, they approached us about an exciting new opportunity: the ICA Watershed. This space transformed a 15,000-square-foot, former copper pipe facility into a civic and cultural asset for the community. Talk about a #wcw - waterfront crush Wednesday! This grand opening was a perfect opportunity to run a summer-long campaign to increase awareness and drive attendance to this gorgeous new gallery space. 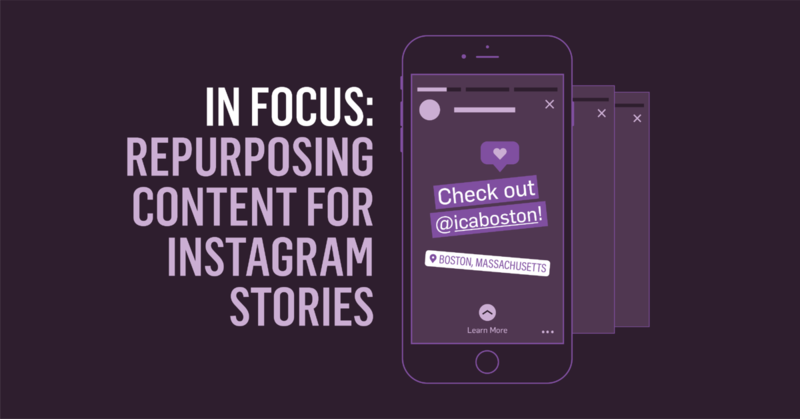 Just like ICA/Boston expanded their programming, we worked with them to expand their marketing mix to include Instagram Stories ads. Our campaign launched three months in advance of the ICA Watershed grand opening. Like many visual arts organizations, the ICA/Boston has a unique challenge – most visitors buy tickets on-site instead of in advance. With this in mind, we created a few proxy conversions in the form of key page views (KPVs) to ICA Watershed’s landing page to measure the campaign’s success. The campaign launched on Facebook, Instagram, and Google Display and focused a majority of their media spend on current audiences in the Boston seaport area. This included CRM lists of members, lapsed members, as well as Instagram engagers, and remarketing audiences. As we know from the flywheel model, people who are already in your universe are the most valuable assets you have because they fuel word of mouth. Fast forward to a few weeks out from ICA Watershed’s opening when we expanded the focus to attracting new audiences with precise digital targeting, including ICA/Boston member Lookalike audiences who were also interested in frequent and leisure travel to Boston. With gorgeous, waterfront views, we pitched Instagram Stories ads as a new, supplemental way to reach prospects and drive engagement. It’s no secret that if you add a new social platform to the mix, there’s an inevitable creative lift. However, we often forget about repurposing content. 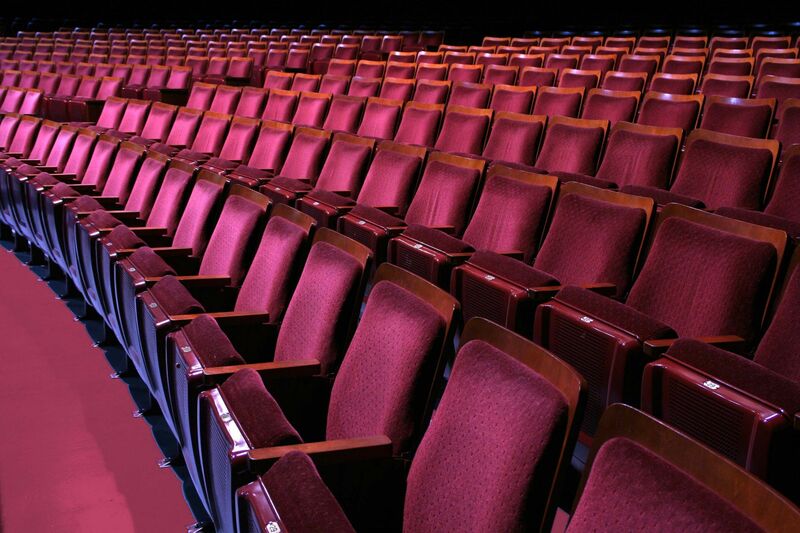 Although we’d love to think that all of our adoring audiences see every piece of content we create, that’s just not the case. As ICA/Boston knows, an organic piece of content can come back to life in a new way. While discussing Instagram Stories ads with ICA/Boston, we noticed a stunning waterfront photo that they uploaded to Instagram organically. We pitched the idea of repurposing content, like this photo, to ease the content lift. ICA/Boston’s openness to experiment and repurpose quality organic posts gave us the opportunity to include Stories ads to this campaign. Between the clever copy, beautiful photography, and experiential feel, ICA/Boston’s content was a huge contributor to the overall success of this campaign. ICA/Boston’s first Story ad in this campaign was a single image with a significant impact. In just five seconds, the user was transported to the Boston waterfront and could easily swipe up to learn more about how to make what’s happening in the image part of their summer plans. The best part? This looks like a Story you might see from your friend. Creating an ad that looks like a sales pitch is the equivalent of turning on Spotify at work, full volume, without your headphones plugged in. It’s jarring to everyone (although I’m sure everyone loves your Sondheim playlist just as much as you do). ICA/Boston also used Instagram Story carousel ads to showcase an even more immersive experience, from the water taxi to the exhibit. These three-part ads appear between Instagram user Stories and last up to fifteen seconds. Instagram Stories helped ICA/Boston increase engagement and raise awareness around the Watershed’s grand opening in cost-effective and efficient ways. The carousel post drove site traffic at an impressive rate of 3.587%, making this the most successful post promoted in our campaigns. Comparatively, the top performing Facebook post drove site traffic at a rate of 2.002%, and the top-performing Instagram feed post drew 1.399%. The first single image Story drove the most Watershed key page views (2,858 KPVs) and impressions (202,188) more than any other post in our promoted campaigns. Since ROI couldn’t be calculated because there were no purchases, another key performance indicator was how much it cost to drive KPVs. Instagram Stories ads were the cheapest placements to drive key page conversions at $.38 per KPV. Facebook came in second with an average $.61 per KPV. Instagram feeds cost a whopping $1.10 per KPV. An added bonus? These Instagram Stories ads drove purchases for other events at ICA/Boston including a significant amount of membership purchases. So, what makes ICA/Boston’s first foray into Instagram Stories ads #Instagood? ✓ Immersive, Personal Content: Instagram Stories ads provided a great outlet to convey the experiential nature of the Boston waterfront. Instead of making a sales pitch, they opted to showcase some of the best features of the Watershed that created a summer outing feeling users couldn’t resist. ✓ Repurposed Content: ICA/Boston didn’t have to reinvent the wheel. They repurposed gorgeous photos and added clever copy, which proved to resonate with fans. ✓ Efficient, Cost-Effective Results: Given the strong, overall performance of the campaigns, we were able to spend more on acquisition which allowed us to continually refill remarketing pools. Instagram Stories ads helped us achieve high KPV rates at a very low cost.